Save $10 on Nutro Natural Choice Dog Food (30#) in August at D&L! 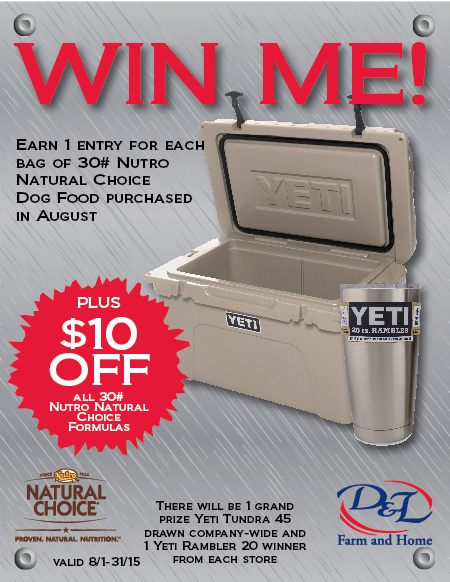 Plus, when you purchase Nutro Natural Choice Dog Food you’ll get to enter for a chance to win a Yeti Tundra 45 Cooler or a Yeti Rambler 20. Stop by D&L for more details, valid 8/1/15-8/31/15. NUTRO™ Dog Food gives your dog premium natural nutrition that’s tailored to their life stage, breed size and health condition. Our high-quality natural ingredients deliver visible benefits for a difference you can see. For more information on Nutro Dog Food you can visit their website or stop by your local D&L Farm and Home.